Some here have been robbed recently. Here is a clever solution. Years ago we had a dog who was the offspring of a bordercollie/sheltie mix and a boston terrier. Yeah, interesting mix, but turned out rather good. Anytime anybody came close to the property he'd be at the window barking, very loudly. We felt very safe. 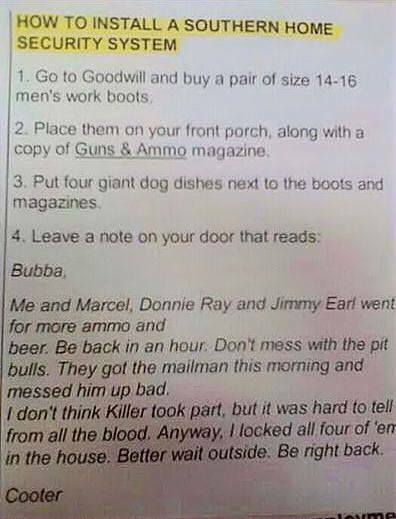 This might work if the crackheads coming to rob you could read. That would be a deterrent.